Satellite Link is a powerful software option that enables you to synchronize and control up to 12 Pro Tools|HD systems as one, with near sample-accurate lock, from a single transport—all without having to purchase additional hardware. It’s the perfect solution for post-production and music environments with multiple operators and multiple Pro Tools|HD systems. Satellite Link is a powerful software option that enables you to synchronize and control up to 12 Pro Tools|HD systems as one, with near sample-accurate lock, from a single transport—all without having to purchase additional hardware* It’s the perfect solution for post-production and music environments with multiple operators and multiple Pro Tools|HD systems. * Pro Tools HD 10 or higher software required to sync up to 12 Pro Tools|HD systems; earlier versions of Pro Tools can sync up to five systems. 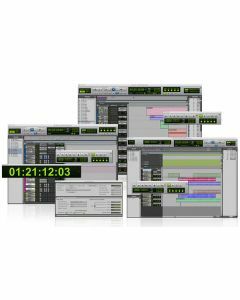 *Sync up to 12 Pro Tools|HD systems with Pro Tools HD 10 or higher software; sync up to five systems with Pro Tools HD 8 or 9 software.